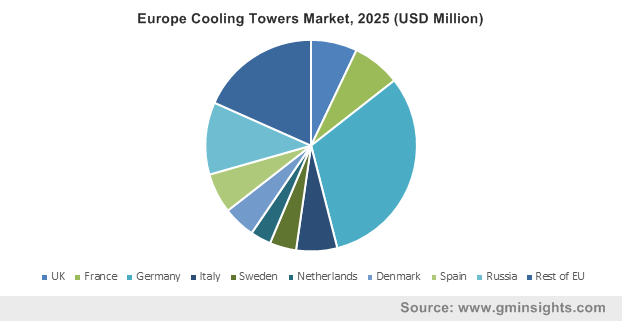 Cooling Tower Market size in 2018 was valued over USD 2 billion and is anticipated to grow over 4% by 2025. Increasing deployment of HVACR systems across the commercial establishments along with upsurge in investments toward industrial development will stimulate the market growth. Favourable government policies owing to the development of lower emission technologies along with expansion of sustainable cooling network will favour the product penetration. In addition, a sturdy growth in power generation and continuous dependence on coal based generation will boost the industry growth. 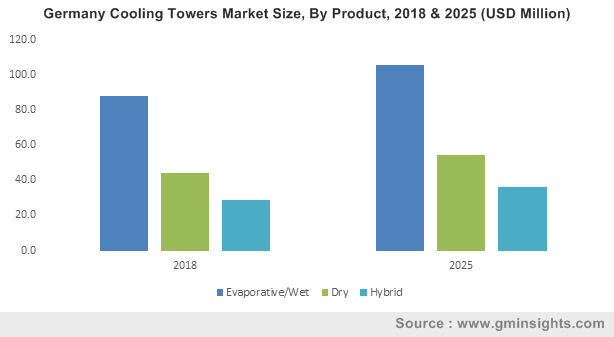 Evaporative/wet cooling tower market accounted for over USD 1 billion in 2018. Reduced noise pollution, lower maintenance cost, high performance and energy efficient are some of the prominent features which will boost the product adoption. Increasing investments toward technological developments for improvement in the communication capability, efficiency and flexibility in design will encourage the product adoption. Growing investments toward heating, ventilation, air-conditioning and refrigeration (HVACR) systems on account of emerging construction industry will boost the open circuit industry share. Ongoing technological advancements to remove various biological contamination along with ease of integration with dry and wet towers and reduced construction cost will stimulate the business growth. Mechanical design in 2018, accounted for over 50% of cooling towers market share. Greater stability, reduced capital cost, minimum effect on environment by humidity and high thermal performance are some of the key parameters which will boost the product adoption. In addition, the increasing investments toward development of industrial and commercial buildings will propel the industry growth. Robust increase in conventional power plants including coal coupled with upsurge in investments toward development of large industries will fuel the field erection cooling tower market size. These towers are usually constructed at the destination site which reduces the cost of assembling and transportation. Furthermore, ongoing technological progressions related to components coupled with the development of non-corrosive and sustainable materials have provided opportunities to the industry players for expansion. 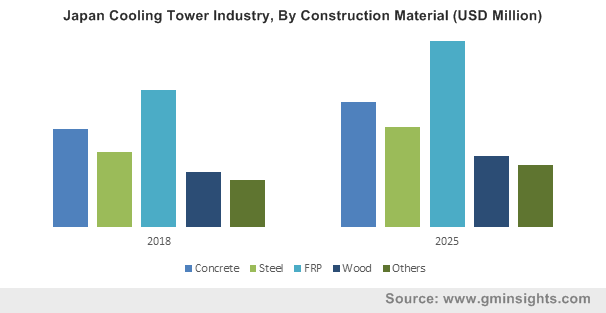 High load carrying capacity, high structural performance, ability to minimize emitted sound levels and architectural flexibility are some of the prominent features which will stimulate the concrete cooling towers market size. Increasing investments toward addition of large scale thermal power plants across India, Indonesia, China and other Middle East countries will drive the industry growth. In addition, the growing use across heavy industrial applications including oil refineries, petrochemical and fertilizer plants will positively impact the industry growth. Crossflow cooling tower market is anticipated to grow on account of limited pipe infrastructure requirement, reduced noise pollution and reduced pumping and maintenance cost associated. The horizontal movement of air across the downward flow of water is the key feature which will propel the product adoption. Furthermore, these systems are filled with splash fillings which are suitable for applications where water consist of high suspended particles. Power generation segment is anticipated to grow at a rate of over 4% by 2025. Rapid expansion of thermal power generating plants coupled with positive outlook toward the use of sustainable energy resources will boost the product demand. The introduction of stringent emission norms has resulted in the increasing adoption of supercritical, ultra-supercritical, and combined cycle plants, which will further stimulate product adoption. The upsurge in investments for the development of industrial and commercial buildings including shopping malls and large offices will fuel the HVACR market share. Furthermore, the growing construction industry primarily across the developing nations will provide favourable business opportunities for expansion. Accelerating investments toward development of coal based power plants primarily across China, India, Indonesia and various other developing nations will boost the Asia Pacific industry. Furthermore, rapid industrial growth along with the increasing urbanization rate will further positively influence the industry outlook. Favourable regulatory policies coupled with development of cross border production networks have provided immense opportunities for the low-income nations to prosper. In addition, positive outlook toward long term political stability of economies across the region along with growing efforts toward the development of domestic manufacturing has enhanced the attractiveness of nations as new hotspots for investments. 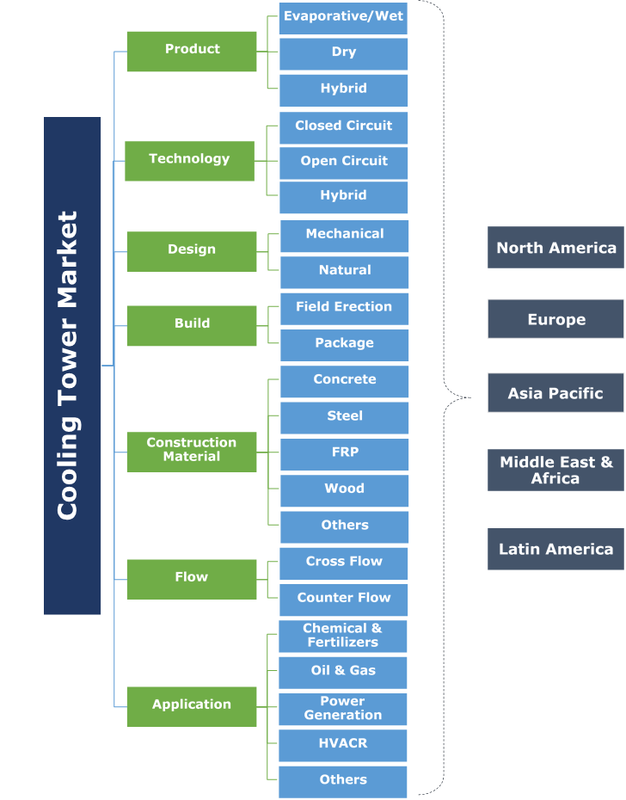 Prominent players operating across the cooling tower market includes ENEXIO, Paharpur Cooling Tower, Haman, SPX Cooling, Baltimore, SPIG, Johnson Controls, Delta, Thermal Care, Thermax, Reymsa, International Cooling, BERG, Brentwood, Bell, ENGIE, Perfect and Star Cooling. The major industry players are adopting innovative models to sustain growth followed by focus on operational prudence in recent years and are concentrating extensively on business expansion by developing strategies. A cooling tower is a heat dissipation device, that extracts waste heat to the atmosphere through the cooling of a water stream to a reduced temperature. The process of heat dissipation in a cooling towers is called ‘evaporative’. Warm water from various sources including heat exchangers, oil refineries, chemical plants and thermal plants is sent to the tower where it enables a share of water being cooled to evaporate into a circulating air stream to provide substantial cooling. These systems are comparatively dependable and inexpensive means of removing low-grade heat from cooling water.